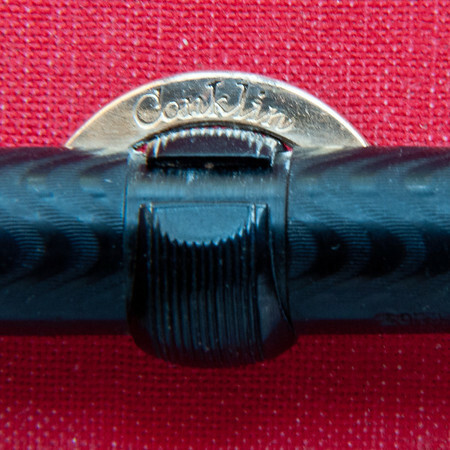 After reading Ed Jelley’s excellent review of the new Conklin Mark Twain Crescent Filler pen, I thought it would be interesting to do a review of the original Conklin Crescent pen. 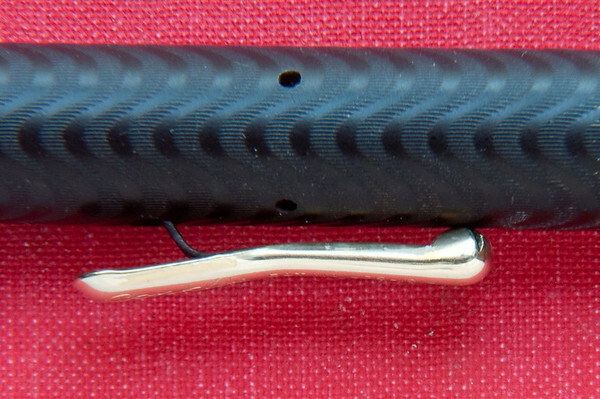 It is obvious that the current Conklin Pen Company wanted to pay tribute to the iconic crescent filler made during the early part of the Twentieth Century. As usual, Richard Binder’s website has an excellent summary of the history of crescent fillers from the original Conklin to several modern crescent fillers. The Conklin Pen Company was founded in 1898 by Roy Conklin in Toledo Ohio. Their best know pen was the crescent filler, which was so popular that, for a brief time in the 1920s, the company was one of the Big Four. 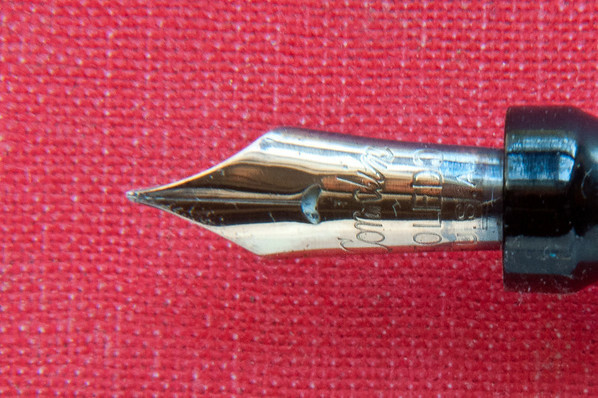 The early Conklin pens had a slip cap. The screw on cap was introduced in 1910. Crescent filler pens were made of hard rubber, sometimes with gold or silver filagree overlays like the Peter Pan pen discussed in the previous post. Other models had solid gold or silver coverings with elaborate embellishments. 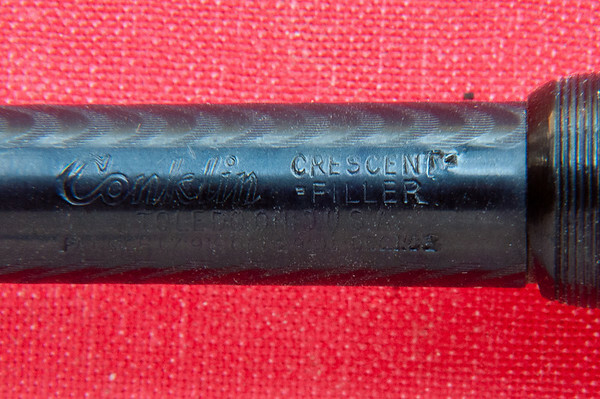 The last crescent fillers were made in 1928. By the middle 1920s it became clear to most pen manufacturers that plastic pens would supplant hard rubber. Conklin introduced its Endura model in 1926. These lever filling plastic pens were made until 1932. They came in several colors and patterns similar to the Parker Duofolds of that era. One of the most beautiful pens Conklin ever made was the Nozac, which was made from 1932–1938. The pens were either round or 10 sided in the early years, but later models had 12 or 14 sides. A nice innovation was the word gauge. A measuring scale was engraved on a transparent section of the barrel. The scale was calibrated in thousands of words remaining so that you could tell how much longer the pen would write before running out of ink. I have a few of these later model Nozacs in my collection. One of these will be the subject of a future post. The depression of the 1930s took a severe toll on the Conklin Pen Company and they were virtually bankrupt by 1939. The company was sold to a syndicate in Chicago that made cheap pens and wanted to capitalize on the prestigious Conklin name. 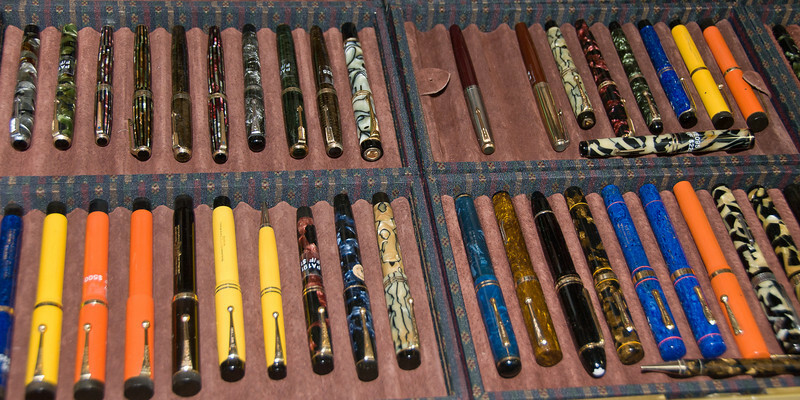 However the Conklin pens made in Chicago were so bad that most vintage pen collectors avoid them. The Conklin Pen Company limped along until it went out of business in 1948. As in previous posts, I’ve used a modern Parker Duofold Centennial for comparison. The pictures shows that the two pens are about the same length when posted. The Duofold is noticeably wider and the massive 18K nib outshines the smaller Conklin 14k nib. However, the Conklin nib is a very flexible nib, which is just about perfect for writing with significant line width variation. The weight and size of the pen are given in the table below along with the corresponding measurements for the new Conklin Mark Twain and the Parker Duofold Centennial. For the Mark Twain, I used the measurements provided by Ed Jelley in his review. Note that Ed Jelley’s measurement of the Mark Twain’s weight was made with the pen filled whereas my measurements are made when the pens are empty. I would guess that the ink in the Mark Twain weighted about two grams, which would make the weight of the Mark Twain and the Duofold about the same. The Conklin Crescent is a little smaller than the Mark Twain when capped, but a little bigger when posted. The nib is extremely flexible; it takes very little pressure to spread the tines. The clip on the Conklin Crescent is gold-filled and shines brightly. Because the process of gold-plating used today creates a very thin coating of gold over base metal, it is not as durable as the older gold-filling process used on the 1920s Conklin Crescent. The clip may be polished repeatedly without fear of exposing the base metal beneath. The clip is attached to the cap by a stiff metal rod that provides the spring action when you press on the back. 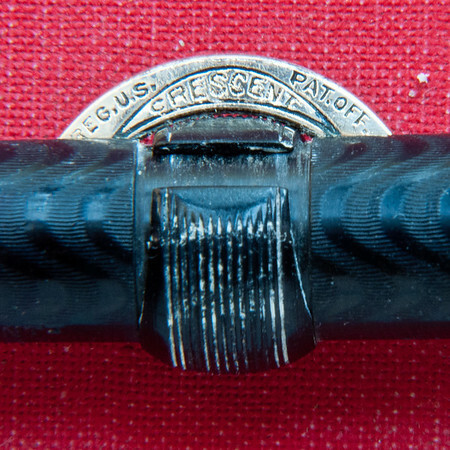 Since the crescent is the defining part of this pen here is a picture of each side of the crescent. Notice the important slip ring that grips the barrel and slides between the crescent and the barrel. In the position shown, the slip ring keeps the crescent from squirting ink inadvertently because the crescent can’t be depressed. However, if you turn the slip ring so that its slit is directly under the crescent, then the crescent can be depressed to fill the pen with ink. The engraved crescent encompassing the word CRESCENT helps to date the pen. These markings were used on the crescent from 1918–1928. There was no design change during these years so it is impossible to refine the manufacture date any closer than this interval. Another constant was the engraving on the barrel. 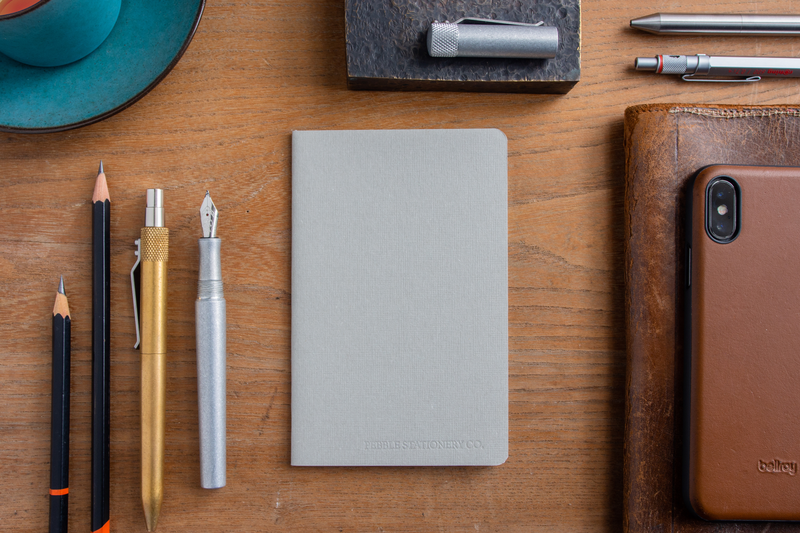 The vintage Conklin Crescent Pen was a great pen in its day and remains a pen that is worth using today. The super flex nib would be fun to use. If you find an old Conklin Crescent with a dried out ink sac, it is generally fairly easy to replace the sac. Replacement sacs are available online and at most large pen shows. It takes a bit of skill to disassemble any pen that uses an ink sac, so practice on a junker before attempting to open a valuable pen like the Conklin Crescent, or find someone who is experienced to do the repairs. It seems as if the crescent would get in your way when writing, but if the nib and crescent are aligned there usually isn’t a problem. One advantage the crescent fillers have over the more common lever fillers is that they won’t roll off a table!